After experiencing the worst internet connection ever (forced me to go offline for a week), I've found a way to reduce my work load and manage my business effectively. Should you really be doing everything that you do in your business? Why grow your business alone? Do you adapt to your environment? [Click To Tweet]. An unusual delegation story [Click To Tweet]. James Schramko here, and here we are at the Caribbean, in the Dominican Republic. It’s been a really interesting week. Of all the places I’ve been, everywhere in the world, this place has had by far the worst Wi-Fi Internet that I’ve ever experienced. In fact, I’ve pretty much been offline for the entire week, and it’s forced me to do two things that I wouldn’t normally do. The second thing is, it’s really forced me to create new standard operating procedures, to take things to the next level with my team, because I also sent them an email saying, “You’re probably not going to hear from me between now and the end of this week.” So what it’s forced us to do is for me to have a look at everything that I felt that I should be doing or that I might do on a daily basis when I have Internet connectivity and to make a mental note of that and then to discuss that with my team manager. When I get that brief window of Wi-Fi, which is about four in the morning, when everyone’s asleep, I’m able to then have that quick discussion with them, and of course they’re like twelve hours out in my timezone. And we’ve already been able to develop some new standard operating procedures which mean that I will no longer have to do some of the things that I used to do. Not just now, but I’ll never have to do them again for the rest of my life. How would you cope without Internet? So my challenge for you this week is: What things are you doing that you could not do if you could not connect to the Internet, and is there a possibility that you could have someone else do that for you? Well, I’m James Schramko, I’ll catch up with you when I get a faster Wi-Fi. Great Challenge – I will be giving it a go! I love how adversity creates opportunity (Also love your version of adversity) Funny enough, I have been creating SOPs also for myself recently to cut down on wasted time for things I only do occasionally – think longer term that will pay off too, but the interesting bit is I also found it helps me to think about how you go about things and make them more streamlined. Cheers! epic Quinn! thank you and well done! James, I just saw the headlines about the typhoon… are your ninjappinos alright? Yes thanks we are loading a video now to explain more. Hi James. 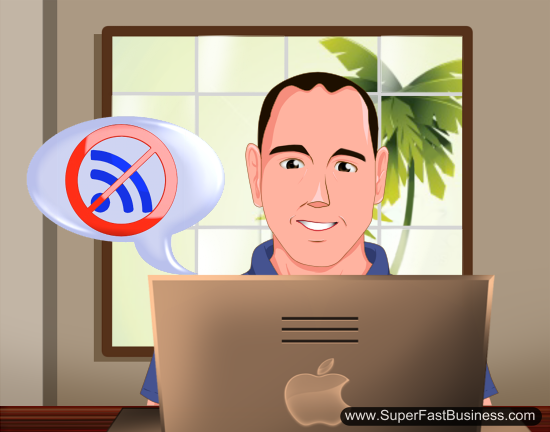 Are you aware that wi-fi causes cancer, and a host of other health complaints? Adam I am not however nothing would surprise me. I have not seen the science on it. Do you have some research you would like to share? I see about 1 new article every few weeks in my Facebook news feed about the latest study confirming it. Ill send you something in the future when it pops up again. Its pretty well known and Im sure you can find something on Google very easy. Most countries have movements to get it banned in schools and workplaces, and it has been in many so far, but I think Australia is a bit far behind. Correct, but of course if you are the base station then your radiation exposure will be at the maximum levels. I think there are around 10 countries now which have introduced varying forms of public bans. Slowly but surely the bans will get to Australia. there are wifis in every shop, house and public place. There is no escape. Umm, it always helps to get unbiased articles. More examples of cancer clusters. There are cancer clusters for people living near mobile phone towers, working in wifi environments, and plenty of other EMR devices. There was even a survey conducted over a large suburban area in England, asking if people in the households had got cancer. When they plotted the cases on the map, they noticed that they were all formed into little clumps. Upon further research, they found that there was a mobile phone tower in the middle of every clump. The evidence is overwhelming and cant be denied. In fact, I have studied your referenced claim by the WHO that its a class 2B carcinogen. Even that study was manipulated. They changed the definition of a frequent user from something like 30 min a day to 5 min a week to water the amount of cancer cases down. And even then it was still bad enough to pick up a class 2B rating. I remember once I shared this article on Facebook – http://www.muslimsandtheworld.com/scientific-study-on-rats-proves-mobile-phones-damage-the-brain/ – and someone like you also attacks me and sends a link to an article saying that mobile phones dont cause brain cancer. Then I politely informed him that, as stated in the article, all the research facts and proof were provided by Motorola. I think you need to check the sources before sending that kind of junk through. Here is a funny fact: Almost all scientific studies conducted on EMR danger say that there is no proof it causes cancer, while almost all scientific studies conducted by independant, non-telecommunications industry funded research institutions show that EMR causes cancer. Strange isnt it. Wifi is everywhere, yes. So the idea is to take some steps to minimise or avoid exposure. Move house or city if needed. Help to educate people. There is aspartame, MSG, and other toxic susbstances in 99% of non-living supermarket food. Do you just eat it and say its everywhere? Most people do. But I am aware of what those substances do to the body and I dont eat them. Its your choice. One thing is for certain – if you have wifi in your own home – get rid of it and use cables. Its just not worth you or your family getting cancer. The base station is in your own home. If you must, shield your walls from neighbour’s wifi. In regards to educating people – There are huge movements in Europe and also other countries to ban it. So far up to 10 countries there now have some sort of public ban.